For years I've disliked containers that stand bottom side up. When they first came out, I didn't trust them. I imagined the honey escaping its plastic jar, spreading among the spices, gluing them to the shelf. When it became clear that they actually work, I discovered another reason to dislike them: the problem of the half-way mark. I'm in the shower, my head full of shampoo, a half-empty Prell container in my hand, trying to decide whether to stow it right side up or upside down. It's a minor decision I'll grant you, but I don't like to make decisions before I've had my coffee. Maybe you should just turn them over all the time, you might say. You see upside down ketchup bottles in restaurants all over the place. Why not? As I was waiting for the honey to reach bottom this morning, I realized how important these few seconds are. In an era of instant everything, waiting for the honey to reach its destination adds a few peaceful moments to my life that I would otherwise lose. Besides, being upside down is unnatural. Who knows what the long-term effects will be of all that ketchup standing upside down for all that time? 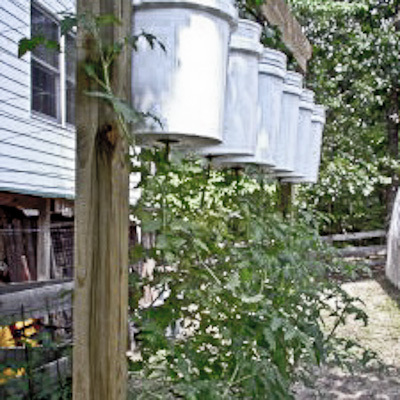 Next thing you know they'll be trying to grow upside down tomatoes.